Description: An original acrylic and mixed media painting by Carolynne Coulson on a 0.71" deep box canvas with the sides painted ready to hang, no frame required. The painting is fixed and protected by a layer of UV gloss varnish and is the first in a series of semi abstract paintings on the theme of objects of desire. Very bright in colour and multi layered in both textures and forms they are a reflection of the advertising and brand focused visual frenzy of the shopping experience. 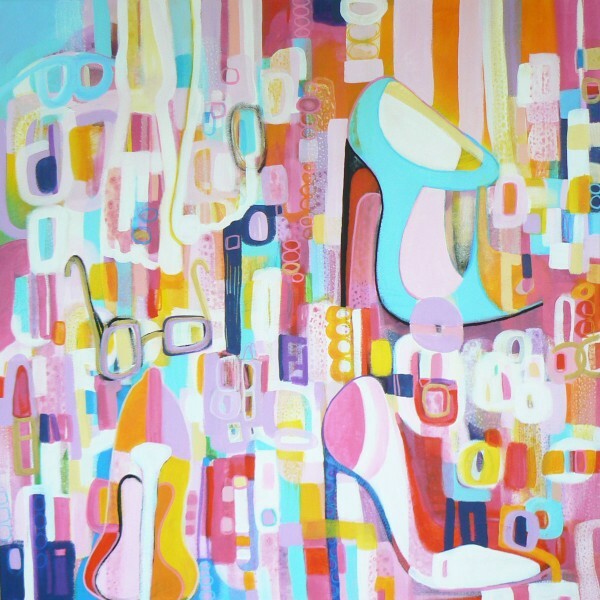 This particular painting features among other things shoes, lipsticks, sunglasses and toe rings. See what else you can spot!